The Pullo Center at Penn State York welcomes THE PINK FLOYD EXPERIENCE LIVE IN CONCERT, PERFORMING 4 SIDES OF FLOYD to its stage on Wednesday, February 25, 2014, at 7:30 p.m. Ticket prices are $48.50 and $36.50 and will go on sale July 18 at 10:00 a.m. Members can order now. Tickets can be purchased at The Pullo Center Box Office, charge by phone at 717-505-8900, or online at ThePulloCenter.com. Without question, Pink Floyd remains one of the most successful and influential rock bands of all time. Syd Barrett’s troubled genius, Roger Waters conceptual mastermind, along with David Gilmour’s soaring voice and guitars created this vastly influential and enduring musical legacy! 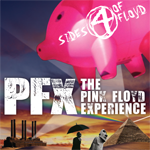 Now get ready for PFX-THE PINK FLOYD EXPERIENCE performing 4 SIDES OF FLOYD. A fully packed multimedia show covering four complete album sides off of four beloved classic Pink Floyd albums. Featuring a spectacular light show, state of the art video, full quadraphonic sound and six outstanding musicians, PFX – THE PINK FLOYD EXPERIENCE brings you the most authentic Floyd experience. It’s “a must-see for any Pink Floyd enthusiast!” (C-News, Northampton, MA). In addition to the 4 SIDES OF FLOYD you’ll hear a set of Pink Floyd’s Greatest Hits, including “Money”, “Wish You Were Here”, “Comfortably Numb” and more! Some Floyd Facts: More than 200-million albums have been sold since 1967. Four Grammy nominations in the '70s, '80s, and '90s. They were one of the first bands to use pyrotechnics, video, and light shows in their stage acts. They were inducted into the Rock and Roll Hall of Fame in 1996. ”Dark Side of the Moon” broke all chart records when it stayed on the Billboard Top 200 Album charts for 741 weeks. It stayed there from 1973 to 1988. Nearly 1,000,000 Pink Floyd catalog albums are sold each year worldwide.